This June, I participated in one of the most physically challenging things I have ever done. 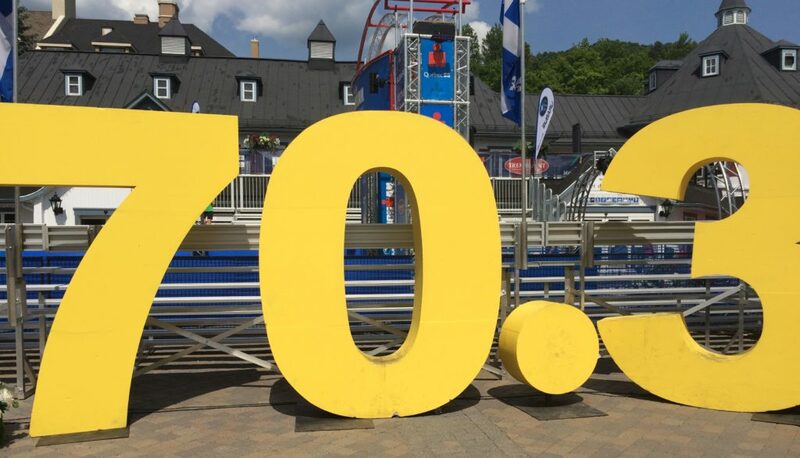 I traveled to Mont-Tremblant Quebec, in Canada, to race in my first ever half Ironman. A type of triathlon, a half Ironman consists of a 1.2 mile swim followed by a 56 mile bike ride and a half marathon. This is the second longest typical triathlon, the longest being a full Ironman in which all of the previously mentioned distances are doubled. Getting ready for this event takes months of preparation and training. However, despite the amount of exercising and training you do, nutrition is a super important key for racing well and racing healthy. Here is a breakdown of what I ate during the week leading up to my race, nutrition during the race, and my post race celebration. The days leading up to a race are very important for game day performance. You have to make sure you’re getting all of what you need and little of what you don’t, and that you’re being careful to not eat many odd/new things that might upset your stomach. The last thing you want is an awful gastrointestinal issue while you’re 30 miles out on a bike. Nutrition the week before a race can really affect how I perform. I tried to be conscious of what I was putting into my body. The week before the race was also when I started tapering (scaling back my workout regimen to rest up my body for the big day), so I had to be careful not to overeat, since I wasn’t burning as many calories as my body had been used to. A few days prior to the race was when I began focusing on getting more carbs into my body. For a race of this caliber, a spaghetti dinner the night before wasn’t going to work. I needed to start building up my energy stores well in advance. My mother, a seasoned triathlete with two Ironmans under her belt, advised me to start cutting back on fiber, so as to avoid any urges during the race. 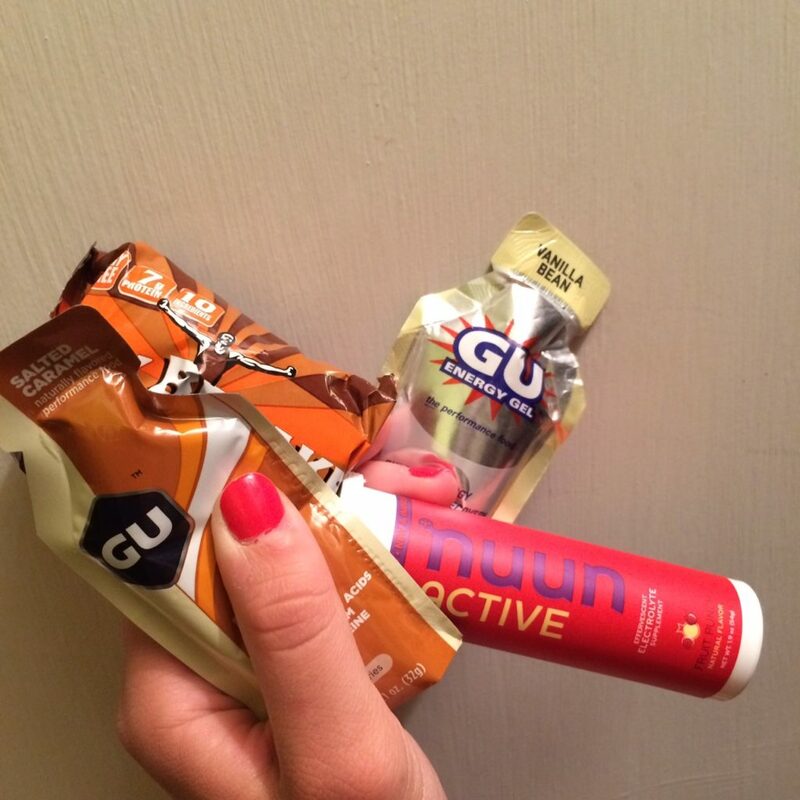 Day before race nutrition can make or break a race. I wanted to make sure I got the right amount of food without eating too much. This day is hard because the nerves are starting to hit and all you want to do is shove ten pounds of ice cream into your mouth but you can’t because you’d feel awful the next day. My biggest meal of the day was breakfast. Eating a huge meal the morning before a race allows all of the food to turn into energy stores, while saving you from feeling gross the next morning (race day) when you wake up. After a gentle and short workout to get our blood flowing, my mom and I made our way down to the hotel’s breakfast where we feasted as if it were our last meal on earth. I had: two mini waffles topped with walnuts, strawberries, and syrup; a pancake; eggs; oatmeal with raisins; a mini pastry; 2 pieces of raisin toast with butter; two glasses of orange juice; a glass of apple juice; and a little bit of bacon. Our plates were so monstrous that they literally peaked in the middle. We were aware that the next day would be insanely hot (upwards of 90 degrees) so we put salt on as much of our food as possible so we wouldn’t sweat out too much during the race. With this in mind, I popped a few salt tabs that day as well. Around 4 o’clock, hunger struck again. This meal was a swear-by rule from my mother — a turkey sandwich on white bread. Along with that, we ate some potato chips (for the salt) and finished with one Oreo each. This meal was small and early, so we would feel light and ready to go in the morning. I was in bed by 7, and it was amazing. Breakfast on the morning of a race for me at this point is ritualistic. 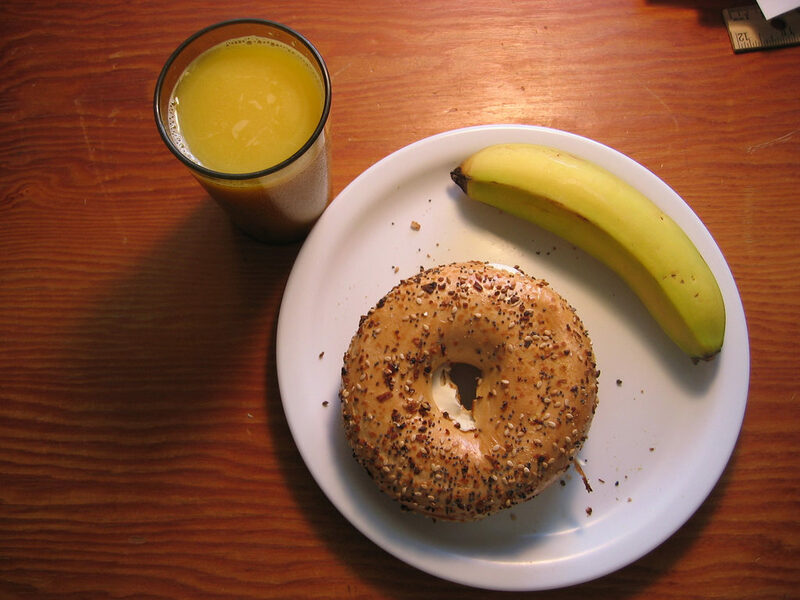 I ate a banana and half of a white bagel about 2.5 hours before the start. 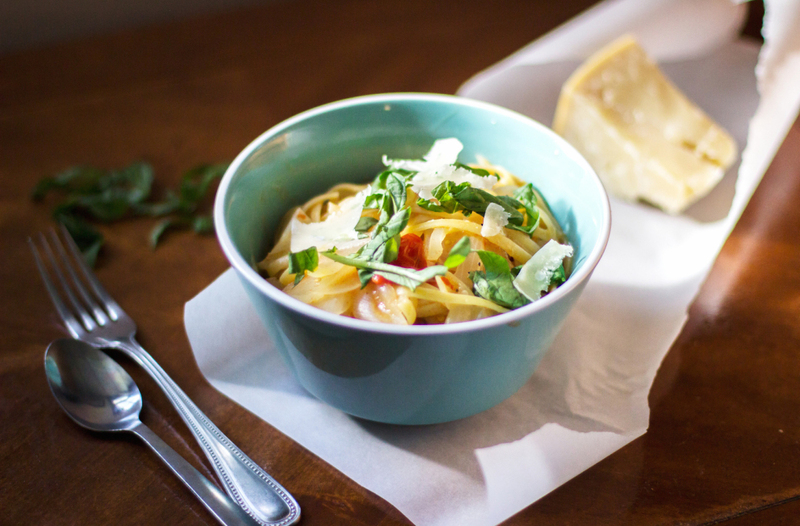 I like this meal because it’s carb-y and easy to digest. I’ve also just become insanely superstitious about the whole thing. A lot of people (aka me before I started doing triathlons) might not think about nutrition during endurance events, but it’s extremely important that athletes continuously fuel their bodies with all of the nutrients they need to keep moving. People go about this in several ways. It’s important to know that every athlete is different and has their own preferences regarding brands, products, and flavors. The following is what I used to fuel my race. Clearly I did not eat anything during the swim. However, once I was in transition and about to go out on the bike, I took one salt tab and ate a vanilla bean GU energy gel to get me going for the long ride ahead. The bike was easily going to be the longest part of the race, and nutrition during the ride was incredibly important. Because it was so hot, all of the water I had was mixed with fruit punch flavored Nuun tablets, to provide electrolytes. My strategy to deal with the intense heat for the entire race was to take one salt tab every hour and one electrolyte tab every two hours. I staggered these times so I wouldn’t take both at the same time. I also continuously sipped on my Nuun water. About 1.5 hours into the bike, I took another GU. This time, I opted for the chocolate peanut butter flavor, which was very delicious (I’m a big fan of GU, okay). A little before mile 50 hit (about 3 hours in) I was beginning to feel the effects of not having solid food, mixed with the tiring of my muscles and the overwhelming heat. I immediately reached for a coconut cashew Bonk Breaker and took a few bites. The presence of “real” food was a relief. The run was by far the hardest part of the race. The heat was ridiculous and I was feeling pretty tired. Thankfully, there were rest stops every mile, and I stopped at every single one so I could grab ice to put in my sports bra and hat. I decided to mix some grape-flavored Powerade with water, because I was scared I would be sick of the fruit punch Nuun. I’m very happy I went with this decision. For the first half of the run, I was run/walking and struggling a bit with feelings of nausea from all the sweet stuff when I passed my mom on her way back. She told me to sip the cola they were handing out at the aid stations to help with the nausea. Unfortunately, this made everything worse. I decided more GU might help so I reached for my salted caramel flavored GU (literally the best flavor, ever). While the presence of calories did help, the nausea did not subside. Once I hit the turnaround for the run, I made the decision to only sip on water the whole way back. Crossing the finish line was probably one of the most proud moments of my life. I couldn’t stop smiling and I almost cried with joy because it was finally over and the realization of accomplishment had set in. Oddly enough, the last thing I wanted was food. I sat down at a picnic table and pleaded for water when my mom asked what I wanted. When we got back to our hotel room a while later, my nerves had finally settled and hunger set in. I opted for some flavor-blasted cheddar cheese and pretzel goldfish. 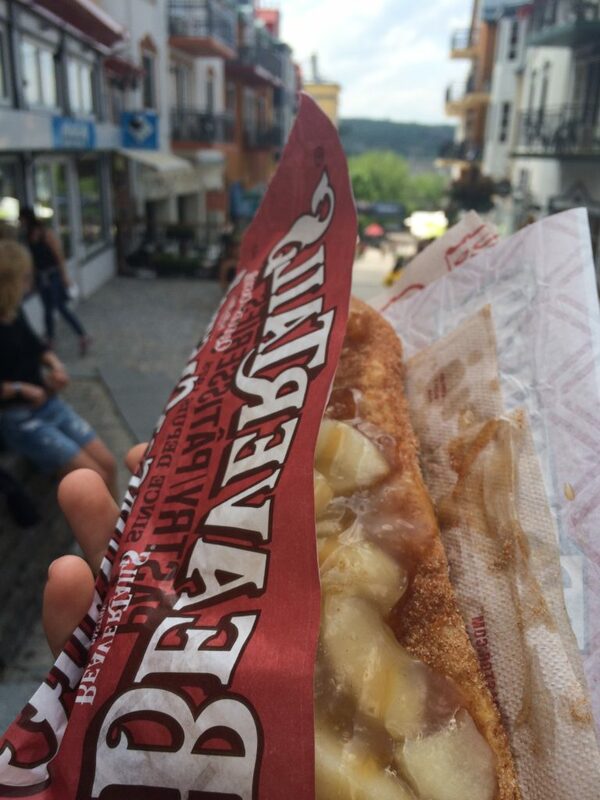 At this point, my mind was on eating basically whatever I wanted for the rest my stay in Mont-Tremblant. That night for dinner, I got a tuna salad sandwich because it was literally the first thing I saw on the menu and sounded delicious to my starving stomach. Also, I got a side of poutine because I promised myself that it would be part of my post-race meal. 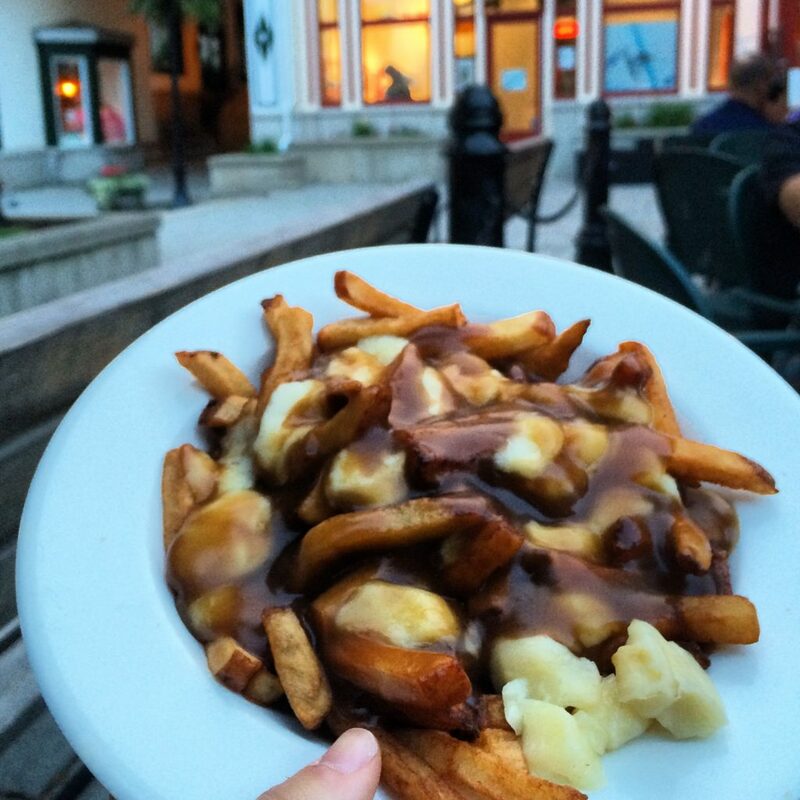 I had been saving my first poutine for when I was in Canada, its birthplace. It definitely did not disappoint. 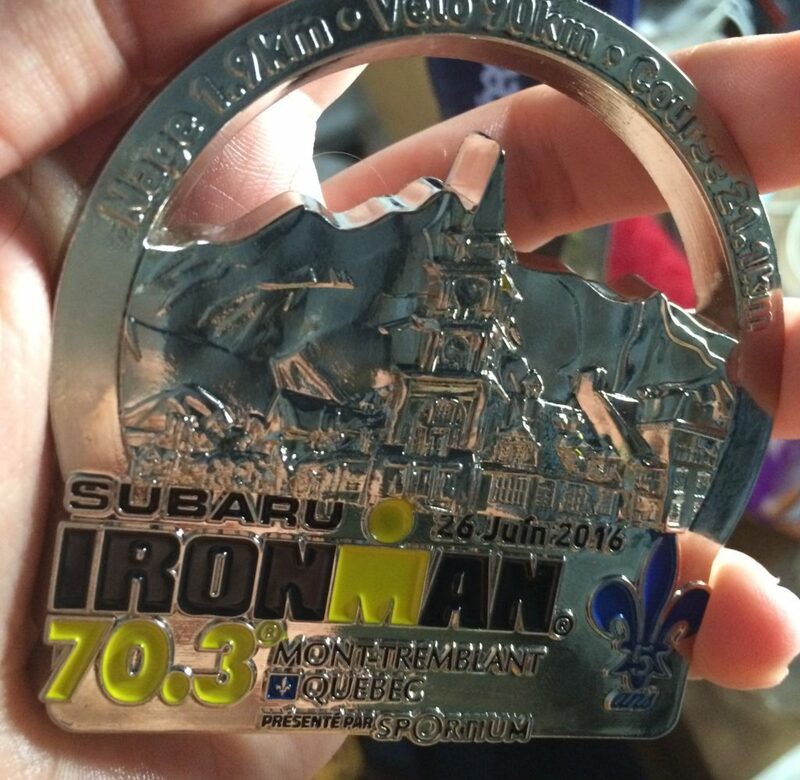 Doing this half Ironman was a really great experience for me. While I didn’t necessarily focus on food, it did have an important impact on my ability to complete the challenge. Mostly, I learned that our bodies can do so much if we treat them right and work hard.